How gorgeous is this entryway?! I love, love wallpaper and think it always brings a space to life. This dramatic foyer was designed by Martyn Lawrence Bullard and I think it's absolutely fabulous. The white double doors and arched window add so much charm. What are your thoughts? Beautiful, but very... dramatic foyer! It makes a big bold statement! Love wallpaper too, and love this entry too!!! I like it in the photo and in theory - the chevron pattern kind of echoes the stairs. I just don't think I could live with it day-to-day. Too hard on the eyes, especially right as you are coming through the door! Fantastic - chevron makes such a dramatic statement! Love it! 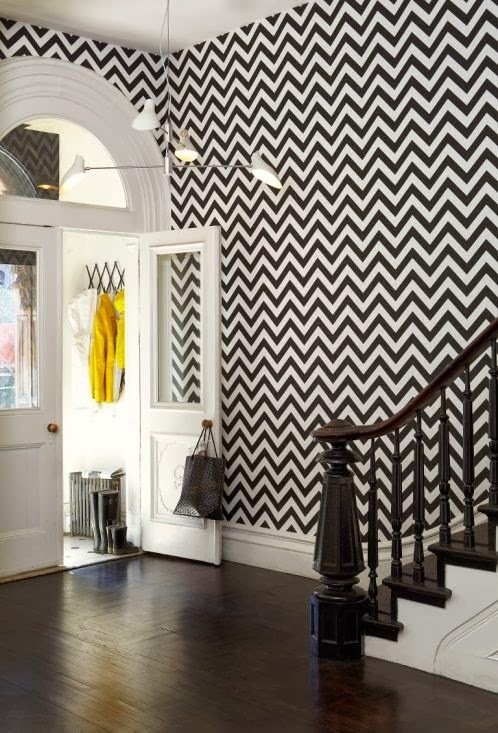 Love the chevron wallpaper too. Looks great!